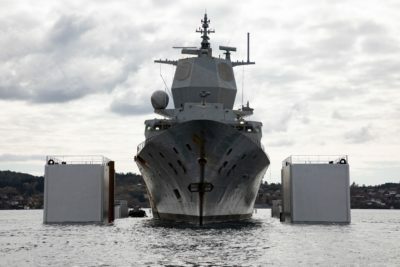 The Norwegian Navy’s ill-fated frigate KNM Helge Ingstad was refloated this week, just six weeks after the sunken vessel was raised from the waters of the Hjeltefjord northwest of Bergen. Members of Parliament, meanwhile, have called for an investigation into the salvage operation itself, because of concerns over how it was carried out and its huge cost. The badly battered frigate, which collided with a fully laden tanker on November 8, is still being evaluated for whether it can ever be seaworthy again. By refloating the vessel, the Navy could better work on literally plugging gashes in the frigate’s hull that are under the waterline, by setting steel plates over the damage. “This is a big operation that has demanded a lot of attention on safety,” said Captain Håvard Mathisen, project leader during the phase of salvage efforts. Work is also proceeding, he said, on evaluating the full extent of the damage to the frigate that will cost Norwegian taxpayers nearly NOK 5 billion to replace with a new one. A report on the condition of the vessel is expected before the summer holidays. Norway’s conservative government coalition had proposed financing the frigate’s replacement by pulling money out of the country’s huge sovereign wealth fund, known as the Oil Fund. Those plans have since been dropped, however, after strong opposition not only in Parliament but from several professors and economists. The collision itself is the subject of ongoing probes by both the police and the state accident investigations board (Havarikommisjonen). The committee voted unanimously to demand an external investigation of the salvage operation that followed, and expects it in time for the reopening of Parliament after the summer holidays.